Take Brave Steps for Stroke Survivors and Families is a ground breaking roadmap that leads survivors and loved ones through the mental, emotional and social maze of stroke recovery. Readers will be moved from bitter to better and find the fork in the road where motivation meets inspiration. With his heart-felt personal stories of motivation and hope, Ron Gardner, a survivor of a devastating stroke, guides readers how to navigate through the fears, adversities and challenges that often go unspoken and unanswered, until now…. 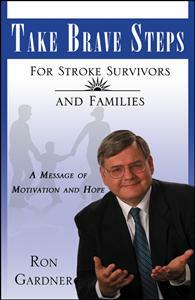 This book is a must read for stroke survivors, family members, caregivers and heath care professionals. I wish I had Ron's book, when my father had his stroke. I would have been alot better as a son. I would have known what my father was going through. I would have been alot more patient in my responses to him. My urge to help would have been tempered with a knowledge of what to do, what to say and how to treat my Dad with a better respect. What Ron and his family share, the lows, the pain, and the love that brought them out of their tribulations is truley inspirational. Ron's steps clearly show you a way to attack the trials of having a loved one hurt by stroke. I rate this book a 5........ why?..... because when my mother-in-law had a stroke years later, I had Ron's book to guide my family, we used the steps given to us ...and her process of recovery was alot better, for herself and for us! I am a stroke survivor. I had a stroke while writing my book, Aimed At America. And I can relate to Ron's message about the point where motivation meets inspiration because my stroke left me blind for about 3 months. But when my eyesight returned good enough for me to read again, the first inspirational message I read was at Ezekiel 24:16 (KJV), which says, Son of man, I take away the desire of thine eyes with a stroke. Wow! I had no idea that word was even in the Bible. And for me to discover it after suffering blindness from a stroke was awesome.